BMW India has launched the latest iteration of the Z4 Roadster for the first time here with an M Performance model. 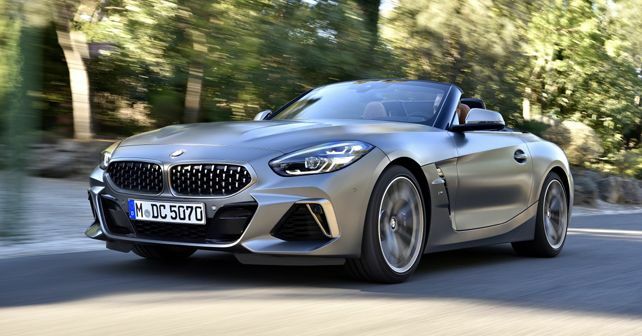 Days after unveiling the car in India, BMW has launched the 2019 Z4 Roadster here in two versions: the Z4 sDrive20i and the performance-spec Z4 M40i. This is the first time that the German marque has launched an 'M' version of the roadster here. While the former carries a price of ₹ 64.9 lakh, the latter has been priced at ₹ 78.9 lakh (all prices are Ex-showroom). Like before, the 2019 Z4 will also be available in India as a Completely Built Unit (CBU). At this price point, the 2019 BMW Z4 undercuts its nearest rivals by a significant margin, as the Porsche 718 Boxster starts from ₹ 89.9 lakh and the Jaguar F-TYPE 2.0-litre Convertible is priced at ₹ 1.01 crore. Both variants on offer will come with a single engine option each, meaning that the Z4 sDrive20i is powered by a two-litre inline four-cylinder petrol engine which develops 194bhp and 320Nm of torque, capable of doing the 0-100km/h run in 6.6 seconds. Meanwhile, the beefier M40i gets its firepower through a three-litre inline six-cylinder motor, which churns out 322bhp and 500Nm of torque and can do 100km/h from standstill in a matter of 4.5 seconds. Both motors belong to BMW's EfficientDynamics family and benefit from BMW's latest TwinPower Turbo technology. Further, both engines come mated to an 8-Speed Steptronic Sport Transmission. While the M40i comes with a host of M goodies as standard, the Z4 sDrive20i can be spruced up with an optional Sport Line or M Sport Package. Talking about standard equipment, the M40i gets exterior bits like 19-inch M light alloy wheels, Cerium Grey finish on the BMW Kidney Grille, exterior mirror caps and trapezoidal exhaust tailpipes while the interior specification has been set to a leather and Alcantara combination with blue contrast stitching and blue piping. In terms of the performance gadgetry, the standard kit on the M40i includes Adaptive M Sport suspension, M Sport brakes and M Sport differential. A key highlight on the all-new Z4 Roadster is the revised cockpit which hosts the new BMW Live Cockpit Professional, a part of the BMW ConnectedDrive. The new cockpit layout comprises of a 10.25-inch digital instrument cluster in a hexagonal frame and an HD information touchscreen. The BMW Live Cockpit Professional also features an adaptive Navigation system with 3D maps, the next-gen BMW iDrive with a touch controller, Wireless Apple CarPlay and Bluetooth connectivity. Customers can also order their Z4 with a host of extra optional features like a 408W Harman-Kardon audio system with 12 speakers, a full-colour BMW Head-Up Display and Wireless Charging.